Traditional sources of capital for the mining sector are being disrupted- in some markets in.2018 new equity issuance by mining companies was at its lowest level in 20 years. The lack of capital for the sector has opened the door for alternative capital providers to provide the source of funding still needed by a capital intensive industry. Increasingly Private Equity and Streaming companies are filling the gap and providing needed capital to mining companies as well as generating attractive returns for their investors. 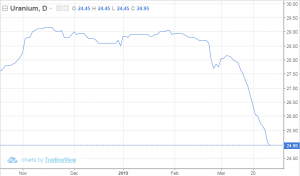 Streaming financing has been at the forefront of alternative capital for the mining sector with companies like Wheaton Precious Metals leading the way. The Asia Mining Club is pleased to present Randy Smallwood, President and CEO of Wheaton Precious Metals, discussing the future of mining finance and how streaming companies are providing capital for the next generation of mining projects. Behre Dolbear is again a proud sponsor of SME’s 7th annual Current Trends in Mining Finance (CTMF 2019) Conference in New York City on Sunday April 28 to Wednesday May 1, 2019. Chris Wyatt, Director of Behre Dolbear, will Chair a round table discussion about Ocean Minerals: A New Frontier to Recover Minerals and Barney Guarnera, Director and Principal of Behre Dolbear, will be a co-panelist as part of a round table discussion about SEC Rule S-K 1300: Modernization of Property Disclosure for Mining Registrants. We hope to see you there! BEIJING, April 1 (Reuters) – Steel mills in the two biggest steelmaking cities in China – Tangshan and Handan – will be required to continue production restrictions in the second quarter as part of local governments’ efforts to improve air quality, multiple industry sources said. Mills in the two cities will have to cut back the operations at about 20 percent of their blast furnaces under the restrictions for the April to June period, down from 30 percent for the restrictions during the November to March period, according to the five sources who spoke to Reuters on Friday and Saturday. Industrial emissions are a major source of air pollution. Local governments in smog-prone northern China have ordered factories during the past two years to cut output during the Northern Hemisphere winter to meet air quality targets set by Beijing. Want the lowdown on European markets? In your inbox before the open, every day. Sign up here. Palladium posted the biggest weekly decline in more than three years as investors’ focus turned to demand amid concerns over slowing global growth. 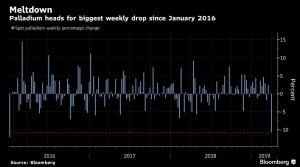 The metal used in auto catalysts to curb emissions sank for the three days through Thursday before paring losses, putting it on course for an 11 percent weekly drop. 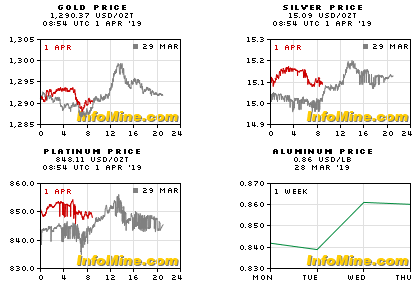 The metal hit an all-time high on March 21 after a massive rally that spurred predictions a reversal was inevitable, with hedge funds cutting bullish bets. West Africa is well endowed with mineral resources, and many world-class deposits have been discovered there in recent years. The region is a key source of gold, iron ore, bauxite, diamonds, phosphate, uranium, and its mainly untapped mineral wealth provides exceptional greenfield development potential. But despite increased interest in the whole spectrum of commodities in West Africa, the region is a hotspot for investment in gold exploration. Foreign companies invested billions of dollars in gold exploration activities over the past few years, resulting in West Africa having the biggest growth rate in the yellow metal’s resources in the world. 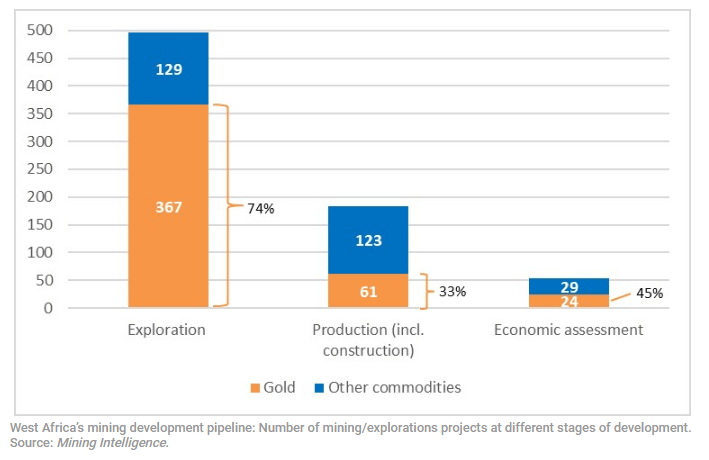 Data compiled from Mining Intelligence’s proprietary database demonstrates the number of gold asset changes within West Africa’s mining development pipeline. AngloGold Ashanti Ltd. is complying with an order from South Africa’s Department of Mineral Resources to amend its mining rights to reflect black economic empowerment, the company’s spokesman Chris Nthite said. The world’s No. 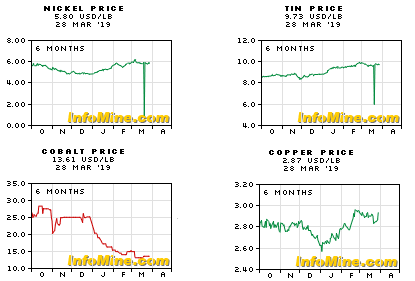 3. gold producer may have contravened black economic empowerment rules tied to its mining rights when it awarded a 4.5 percent stake to employees instead of 6 percent, City Press reported Sunday. The other 1.5 percent was sold to a firm belonging to company Chairman Sipho Pityana. AngloGold denied there was anything wrong with the two transactions, the paper said. Failure to comply with the directive could have placed South Africa-based AngloGold’s mining licences in the country at risk of cancellation, City Press said. Murray Energy Corp. (MEC) was selected as the successful bidder to acquire the Oak Grove, Seminole Alabama and Maple Eagle Mining complexes, located in Alabama and West Virginia, from Mission Coal Co. LLC, through the Mission bankruptcy proceedings. Mission accepted Murray Energy’s bid and filed notice with the bankruptcy court on March 27. MEC has formed a new, majority-owned subsidiary company, Murray Metallurgical Holdings LLC, to acquire and operate the Mission assets, with its existing joint venture partner, Javelin Global Commodities (UK) Ltd., as the minority owner of the subsidiary. 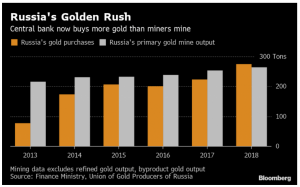 Vladimir Putin’s quest to break Russia’s reliance on the U.S. dollar has set off a literal gold rush. French President Emmanuel Macron said in an interview with CNN in November that European corporations and entities are too dependent on the U.S. currency, calling it “an issue of sovereignty.” Last year, Poland and Hungary surprised analysts by making the first substantial gold purchases by a European Union nation in more than a decade.